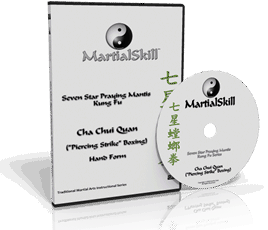 This 2-disc instructional DVD set from MartialSkill.com’s Seven Star Praying Mantis Kung Fu Series covers the Cha Chui Quan (a.k.a. Cha Chuey or Tsaap Choy — in English, “Piercing Strike”) hand form, a core set of the Seven Star Praying Mantis Kung Fu (Tang Lang Q’uan/Tong Long Kuen) fighting system. Northern Praying Mantis boxing was originally derived from 17 different styles of martial arts said to have been brought to the Shaolin Temple over 350 years ago, including Emperor Taizu’s Longfist or Chang Quan boxing style. Cha Chui Quan, typically taught as a beginning or intermediate form, emphasizes motions that reflect the Longfist or Chang Quan influence within Northern Praying Mantis. As a Longfist-inspired form, Cha Chui showcases long-range attacking and techniques, including several techniques not found in most other mantis sets. It also showcases Praying Mantis’ famed hand speed and its ability to attack opponents even while moving backwards.